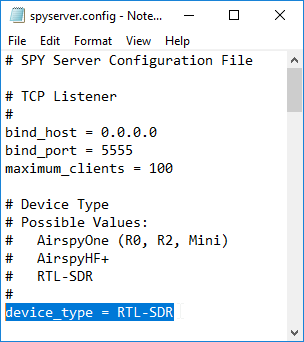 A number of people have asked how to use SDR#'s SpyServer with an RTL-SDR. In this tutorial we will show how to set up SpyServer on both Windows and Linux systems. We try to assume as little knowledge as possible, but we do assume that you have decent experience with computers. Also for the Linux/Raspberry Pi setup we need to assume that you have some basic experience with Linux and setting up Raspberry Pi's. 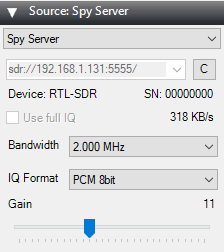 SpyServer is a free RTL-SDR compatible SDR server that is designed to work with the popular SDR# software. It is actually designed for the Airspy range of products, but the author has also made it compatible with RTL-SDR dongles. Running a SpyServer allows you to connect to and use a remotely positioned RTL-SDR over a network connection (such as a local LAN/WiFi or the Internet). Once connected, using the dongle is the same as if the dongle was directly connected to the users PC. Remote servers are useful as you may want to set up an antenna in a remote location (such as up on your roof or shack), and don't want to run a long lossy coax cable down to the PC. Instead you could run Ethernet cable, or avoid cables by using WiFi. All you'd need is power for a remote computing device like a Raspberry Pi 3. Perhaps you also have a great antenna location at a friends house, or other property and want to access that antenna remotely. Or maybe you want to use your radio while travelling. SpyServer is similar to another tool that you may already be familiar with called rtl_tcp. However, SpyServer is regarded as superior because it is signficantly more efficient at network usage. Instead of sending the entire raw data like rtl_tcp does, SpyServer only sends the IQ data of the currently tuned in signal. Waterfall data is processed on the server and sent in compressed form. There is one disadvantage to SpyServer in that it requires slightly more powerful computing hardware like a Pi 2 or Pi 3, whereas rtl_tcp can run on the lowest end hardware. Network usage when streaming with SpyServer will be about 120 KB/s when listening to WFM and about 38 KB/s when listening to narrow band modes for one client being connected. Multiple clients can connect to the SpyServer and share the same currently tuned bandwidth. Setting up a SpyServer server on Windows is extremely simple. Log on to the Windows PC that you want to be the remote server. Go to www.airspy.com/download and download the latest version zip file of SDR#. Extract all the files onto a folder on your PC. Run the install-rtlsdr.bat file to download the RTL-SDR drivers. In the SDR# folder find the file spyserver.config. Right click it and select 'Open With -> Notepad'. Edit the 'device_type' line to show 'device_type = RTL-SDR'. Save and close the spyserver.config text file. Double click on spyserver.exe to start the server. Open the start menu and type in 'cmd' and then press enter to open a command prompt. In the new command prompt type in 'ipconfig'. 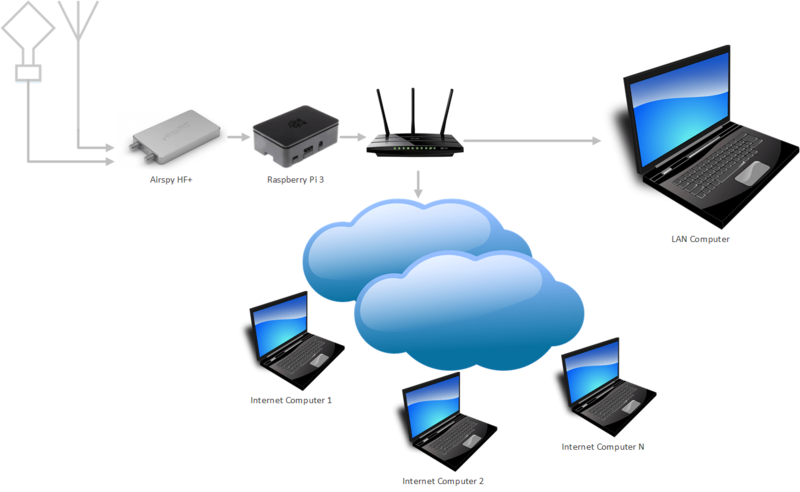 This will display a list of network adapters on your PC, with their current IP addresses. Find the one actively being used (likely Ethernet or Wireless) and note down the IPv4 Address. This is your server PCs IP address. Log into the Linux device that you are using for the server, and open a terminal window if needed. First install prerequisites such as the RTL-SDR drivers and librtlsdr. Create a new folder for the spyserver and navigate into it. Download the latest SpyServer and extract it using the commands below. NOTE: That you will need to download the correct version for the platform that you are using (e.g. 32 or 64-bit, ARM or x86). Go to airspy.com/download, and find the links for the SpyServer download that matches your platform. Replace the link below with it. The link used in this example is for the 32-bit ARM version which is what Raspberry Pi's and most other single board PCsww like Odroids and Orange Pi's use. Use a text editor like nano to edit the spyserver.config file. Change the "device_type" to "device_type = RTL-SDR" (without quotes). If you are unfamiliar with Nano, then note that you cannot use the mouse. You will need to use the arrow keys to move the cursor. Editing is done with the bakspace/del keys and keyboard keys as usual. To save and exit, Press "Ctrl + X", and then the "y" key. Find your device's IP address using the "ifconfig" command. Note NOT "ipconfig" from windows, notice the "f". Write this IP address down as it is the address you'll use to connect to the SpyServer. Note that if you get the error './spyserver: /usr/lib/arm-linux-gnueabihf/libstdc++.so.6: version `GLIBCXX_3.4.21' not found (required by ./spyserver)', then you'll need to install the newer GCC-5 or GCC-6. You'll be asked a few questions during the install and all the defaults are fine. Installation will take about 20 minutes. Once upgraded you should be able to run ./spyserver. If you're setting up a Raspberry Pi as a server then you're probably not going to be connecting it to a monitor. This is called a headless setup. You'll also probably be using WiFi. This tip shows you how to enable SSH and enter the WiFi credentials on a Raspberry Pi without any monitor, keyboard or mouse. If you want you still can of course initially connect a monitor keyboard and mouse and set it up via the Raspbian GUI, or connect a network cable. After writing the Raspbian image to the SD card, put it into a PC and open the boot drive partition in file explorer. To enable SSH simply create an empty text file with the name 'SSH' in the root of the partition. Finally you'll need to look in your routers status page to find the IP address of the Raspberry Pi. Usually the routers access page can be accessed at http://192.168.1.1 or 192.168.1.254, but this address is entirely dependent on your router set up. Consult your router manual or ISP for these details if you do not know them. Once you've set up the server you can now connect to it from a client PC. Log on to the Windows PC that you want to browse the radio spectrum with (client PC). This PC should be on the same network as your server PC (or see below about port forwarding to use remotely over the internet). Download and extract the latest SDR# version on the client PC. Under Source select 'Spy Server'. Enter the IP address of the server in the following format: 'sdr://IP_ADDR:5555' (without quotes). You should now be connected to the remote SpyServer and the spectrum should be active. There are some additional options that you'll see in the Source box. Apart from the standard gain and bandwidth settings there is an IQ format drop down box and a 'use full IQ' checkbox. Use Full IQ - This essentially reverts SpyServer back into rtl_tcp, sending the entire IQ data over the network. Note that you'll need to press the stop button first or this option will be greyed out. IQ Format - This enables/disables IQ compression. With an RTL-SDR in most cases you should use PCM 8bit to keep the network data as low as possible. If you experience problems you can try other options. The limitation with 8-bit mode is that you might loose dynamic range, but for most signals (and the RTL-SDR which is 8-bits anyway) it will be fine. Higher end SDRs like the HF+ may benefit from PCB 16-bit or higher modes in some cases. If you're having performance issues on slower hardware or networks like choppy audio then you might want to reduce the frame rate. You can do this in the spyserver.config text file by editing the 'fft_fps' variable. By default it is 15, try lower values to improve performance. Lower the frame rate results in a more pixelated waterfall in SDR#. You may also want to play with increasing the 'buffer_size_ms' and 'buffer_count' variables if you experience choppiness especially over the internet. After editing the file restart the server. This is simple, but you need to know your upconverters offset. For example the ham-it-up upconverter has an offset of 125 MHz (-125,000,000 Hz) and the SpyVerter upconverter has an offset of 120 MHz (-120,000,000 Hz). If you have another upconverter and are unsure of the offset then consult the manufacturer or it's documentation. To set the offset in SpyServer edit the spyserver.config file with a text editor. Uncomment the 'converter_offset' variable by removing the '#' next to it (do not delete the '#' on the two lines above). You can then set the offset used by your upconverter after the equals sign. Setting 'converter_offset' to -120,000,000 for a SpyVerter Upconverter. Make sure to uncomment it by deleting the '#' next to it. You may wish to set up your server so that it automatically starts on boot. Doing so is simple with crontab. Press Ctrl + X and then 'y' to save and quit. If you want to connect to your SpyServer over the internet then you may need to activate port forwarding on your router. You need to tell your router what IP address or MAC address to forward data coming in from port 5555 which is the default SpyServer port. The data should be forwarded to the IP address or MAC address of the device running the SpyServer. You'll probably also want to ensure that the device running the SpyServer is set to a static IP from within your router. Port forwarding is slightly out of the scope of this tutorial as the procedure is different for each network router. There are guides for most routers in the world at portforward.com. You can find your public IP by browsing to whatismyip.com on a PC on your network, or by running 'curl ifconfig.me' at a Linux terminal. If you want to try out some publicly available remote SpyServers over the internet then please check out airspy.com/spy-servers. We've found that streaming over the internet even across the world is fairly smooth and problem free. With a single dongle, the tuning range is limited to 2 MHz when a second user connects and also for the original user who had full range of tuning. When the second user disconnects – the original user regains full range tuning. Any ideas? Looking up the change log r144 was never released and if it was it would have been back in January 2012 (~1,528 releases since then, it would be the caveman version of SDR#). If I assumed that you made a typo and left out a 4 and actually meant r1444 that is still pretty old April 2016 (there have been 228 releases since than). Why cling to such a really old version of the software ? Hi Bert thank you for the reply. Yes typo meant .1444 and the reason is I’m trying to upload my sdr to globaltuners and their plugin only works on that version. Maybe contact their support (” create a support ticket” at the bottom of this page https://www.globaltuners.com/wiki/receiver_setup ) and ask them to re-build the plugin for the current version (one that is not +2 years old).. Although that page does not explicitly say that the plugin will not work with later versions of SDR#, just that it may not, have you tried. Yea I’ve tried with a few different versions although I’ve managed to connect to pi on sdr# by installing some stuff onto the pi and using RTL-SDR TCP option as receiver. 2 check that all required dependencies are installed “ldd spyserver” if they are not and you are running a 64 bit OS then you will need to install the 32-bit dependencies “armhf”. Whatever dependency is missing use a command like “sudo apt-get install *:armhf” where you replace the * with the missing 32-bit dependency. I’m trying to set up running two server instances running on Ubuntu Linux 16.04. Have each instance running separately but only works with the “wildcard” value (0 or unspecified) for device_serial. As soon as I change the config to specify the serial number, it fails when I try to connect to the server. I’ve tried with two dongles, one of which has the factory default serial number of 1, and the other I changed it to 3 using RtlTool. Device was sleeping. Wake up! I concluded that the value required for device_serial is specifically a serial number for an AirSpy hardware device. Doesn’t look like SpyServer supports multiple generic RTL-SDR devices. Posted a question to the AirSpy support forums but never got a reply. i had same error. Does anyone fixe completely this error? thank you ! Another value that works ok is 900001.
you must change exactly name of model which you have. I have SpyHF+, so I change ‘device_type = AirspyHF+’, and it run very well. Connecting to airspy.com (airspy.com)|5.135.3.67|:80… connected. Connecting to airspy.com (airspy.com)|5.135.3.67|:443… connected. Reusing existing connection to airspy.com:443. Raspberry Pi Zero failed at “Segmentation fault,” identical symptoms to Daniel. 2015 forums note the same issue around rtl_tcp causing segmentation fault with libusb-1 drivers (https://www.raspberrypi.org/forums/viewtopic.php?f=29&t=76355). I’m running linux 9 Raspbian stretch light. Troubleshooting by updating the sources to use main failed, autoremove/install lib-usb-1.0-0 failed. Anyone run into the segmentation fault issue and find a solution? Got “Segmentation Fault” on Raspberry 2 with 256 Mb RAM, ZeroW with 512 Mb RAM, work perfect on Raspberry 3 Model B with 1 GB RAM! I believe SW tries to write beyond the physical address on RAM. Work very well, but i can’t do start on boot my spyserver. I’ve made a crontab as writed, but doesn’t work. Is the directory that you installed the spyserver to the same as ours? If not update the path in the crontab. This was with build 1617 of SDR#. Any thoughts? I just noticed “.exe” in the file name you are running windows 7/8/8.1/10. Will SpyServer work with a Raspberry Pi3 and dual RTL-SDRs monitoring a trucked digital network like a local Fire Department? October 28, 2017 - 12:49 am RPi has great marketing. RPi is cheap, for a reason, when it comes to shoving large amounts of data around fast, it is at or very near the bottom of all devices I can think of. All RPi devices have one real USB 2.0 High Speed port, the B and 3 have a USB hub hardwired into that which is shared by the NIC and four ports are exposed to the world. So if there is lots of network traffic other USB devices have less available bandwidth. And if there is major USB traffic then the network starts to drop packets. It is a bit like sticking 5 funnels in a funnel, and expecting to be able to fill a bottle up faster. 9.6MB/sec is less than 11.9MB/sec, so it should which is good. The only question now is, are the two FFT displays streaming for each device going to fit into the remaining 2.3MB/sec (or 1.15MB/sec per device) I don’t know. Oh and with 3 devices running at once (RTL+RTL+NIC) sharing a single USB 2.0 HS port you will probably not get the maximum through put you will loose at a guess 10% to 30%, but even then there should still be enough room, unless you have other USB devices connected. and…what is your choice for a more powerful hardware than raspi 3? October 28, 2017 - 8:37 pm RPi has great marketing. For shoving data around (not processing power) the BPI-M1 with an actual SATA-2 interface 300MB/sec (not a sata-2-usb chip 40MB/sec) and gigabit Ethernet is not bad.. But the dual core ARM Cortex-A7 (depending on the governor setting can be clocked anywhere from 30MHz up to 1.49GHz with no stability issues that I’ve seen) is about the same level of CPU number crunching as a RPI-2B with 4 ARM Cortel-A7 cores running at 700 MHz (if you ignore the GPU’s which are not usable for data processing in the BPI-M1) . There are later BPI models but they use crappy sata-2-usb chips and the same internal USB hub junk that the RPI do. So it like the RPi-2B looking at the CPU in isolation has about 50% of the number crunching ability of a RPi-3, but for moving data about it is good. There is the UP or Tinker board if Intel chips are preferred but they are a bit pricey. If you really do need GPU number crunching there is always the Jetson. I’m just amazed that people think that the whole RPi line is the bees-knees. October 28, 2017 - 10:05 pm RPi has great marketing. I should probably add that if you run a XU4 at maximum CPU load, it does get hot, and if the temperature gets too high it throttles down performance. If you plan on using it at the limits of performance, the default cooling system is a bit underwhelming and noisy, or at least it was with my revision of the board which was a while ago, they now have a XU4Q version with passive cooling. I suppose what I am saying is that I love the board, but the cooling system is bit anaemic if you are a performance junky. I’m really impressed with AirSpy’s stuff, but I think it’s a little strange that they offer the SpyServer app for linux, but it’s nearly impossible to receive (or find documentation on how to receive) the signal with a linux computer. SDR# only being supported on Windows is a bit of a bummer. The new SDR# runs in Mono, also, I’d wager there’s a way (or may be at some point) to rx the IQ stream in GNURadio -> GQRX. Ignoring the technical advantages, I imagine the whole point of compiling Spyserver for linux is so we can use our SBC’s up the tower or at a satellite dish install instead of using a desktop or rack server, not to mention not having to pay for another windows license. Sure, I get the having spyserver as a raspi/embedded-system-of-the-week to stream the data, i’m speaking specifically of the receiver of that data stream. I’ve been able to run SDR# in linux before with all of those mono dependencies, but it’s been years and SDR# has been closed source since then. GQRX is great, but it doesn’t have support for SpyServer just yet. I don’t believe SoapySDR or any of the others have support either. Man, everyone’s just doing their own thing in their own silo. I wish all of these SDR programmers like Prog and Cseste would band together and make a really kickass product. Yes there is definitely a lack of documentation but there is SoapySDR that has a remote feature to use with any SDR remotely..